More than 450 food products are being taken off shop shelves after they were contaminated with a cancer-causing dye - Sudan I. It is a red dye which is commonly used to colour solvents, oils, waxes, petrol and shoe and food polishes. Since July 2003, all dried and crushed or ground chilli coming into the EU must be accompanied by a certificate showing it has been tested and found to be free of Sudan I. The dye was contained in a chilli powder which was used by Premier Foods to make Worcester sauce. The sauces was then added to a variety of food stuffs, including soups, sauces and ready meals. Why wasn't the food checked? The Food Standards Agency (FSA) does carry out random checks but says it is up to the suppliers to make sure the food does not contain Sudan I. Premier Foods said it had been assured the chilli powder was safe to use. What is the risk of developing cancer? The FSA said the cancer risk, considering the low levels used in the chilli powder, is "very small". Officials say being exposed to the substance does not mean a person will develop cancer and they are asking people who have eaten any of the products not to panic. Tests on rats have shown it can cause bladder and liver cancer. Hundreds of food products have been removed from supermarket and corner shop shelves. Consumers have been told not to eat the listed-products and contact the place where they bought them for a refund. 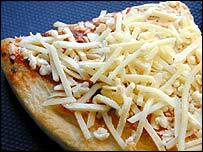 Restaurants and take-aways are also being advised to check the products they use. And the FSA is now working with the industry and local authorities to ensure any remaining affected foods are removed from sale. When was the contamination first discovered? Italy first raised the alarm two weeks ago but the FSA said it did not become fully aware of the scale of the problem until the weekend of 12 and 13 February. It said it spent last week identifying which food products were contaminated before issuing the details on Friday. How did it get into our food?